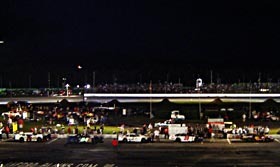 Tuesday, 1:40am - Here are your finishers from the 35th Annual TD Banknorth 250 at Oxford Plains Speedway (ME). It was a long weekend with all of the rain delays, but amazingly every single lap of the race and qualifying events got in. Thanks for reading and we'll see you next year from the 250. Stay tuned for more stories on the 250 at Speed51.com as well. Monday, 10:20pm - Kevin Harvick was too strong for anyone to catch in the final laps of the TD Banknorth 250 at Oxford Plains Speedway. He pulled away from Glen Luce after the final restart to win the event in his first start here. Luce held on to second with Joey Pole, Shawn Martin and Ben Rowe rounding out the top five. Unofficially, we have Nick Sweet, Brent Dragon and Eddie MacDonald just missing top five finishes. Monday, 10:16pm - There will be only one lapped car between first and second on the restart. Monday, 10:11pm - Derek Ramstrom looped his #02MA on the frontstretch to bring out caution #13 and that might breathe some new life into this race. Kevin Harvick had been running away from Glen Luce, but now they will line up with two lapped cars between them on the restart. The remainder of the top five are Joey Pole, Nick Sweet and Ben Rowe. 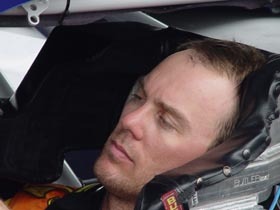 Monday, 10:05pm - We are enjoying a nice long run of green flag racing and that has allowed Kevin Harvick to check out. Behind him, Glen Luce just passed Joey Pole for second. behind them a ways are Nick Sweet and Ben Rowe. There are 25 laps left to go in this race. Monday, 9:55pm - Ricky Rolfe has spun in turn one to bring out the 12th caution of the night on lap 198. That allowed the field to catch back up to Kevin Harvick, who had been running away from the field. Joey Pole is running an extremely high line to hold on to second. He's followed in the running order by Nick Sweet, Ben Rowe, Glen Luce, Eddie MacDonald, Brent Dragon, Scott Payea, Larry Gelinas and Eric Williams. Monday, 9:44pm - Jeff White spun to bring out another caution on lap 169. Monday, 9:40pm - Kevin Harvick's second attempt at a restart worked out well for him - and the flagman didn't object either. Now at lap 168, Harvick has pulled away to a big lead over Joey Pole, Scott Payea, Larry Gelinas and Nick Sweet. Monday, 9:36pm - Kevin Harvick tried to jump the restart. The flagman has decided to give it another shot. Monday, 9:34pm - The caution is out on lap 156 for a spin on the backstretch by the #56 of Dale Verrill. The current top 10 runners are Kevin Harvick, Eddie MacDonald, Joey Pole, Nick Sweet, Scott Payea, Brent Dragon, Larry Gelinas, Eric Williams, Ben Rowe and Shawn Martin. Four drivers are pitting. They are Brad Leighton, Ricky Morse, John Donahue and Verrill. Monday, 9:26pm - We're back to green and there is some great racing going on. Kevin Harvick motored by Eddie MacDonald for the lead...then Eddie Mac passed him back. Finally, Harvick shot down to the inside and retook the top spot. In the back of the field, Ricky Morse's car sounds very sick and about ready to blow something up. Patrick Laperle has also visited the pits under green. He pulled to the inner pit area of the infield and appears to be done for awhile - maybe for the entire night. Monday, 9:22pm - The five minute competition break lasted a little bit longer than that, but we're back to caution laps right now. Eddie MacDonald and Joey Pole took four new tires with no other changes. Kevin Harvick took four tires and a chassis adjustment. Monday, 9:06pm - Track officials have thrown a competition caution at lap 126. It was planned because pit road was expected to be wet. The caution would have come out anyways though since Carey Martin nosed into a light pole in the infield at the same moment the caution came out. He drove away, but lost a lap in the process. Eddie MacDonald currently leads Kevin Harvick, Joey Pole, Larry Gelinas, Brent Dragon, Ben Rowe, Nick Sweet, Shawn Martin, Scott Payea and John Donahue. Everyone has pitted - even the pace car. Teams now have five minutes to change tires and make adjustments. Monday, 8:55pm - The caution is out on lap 113 after a melee that involved Patrick Laperle, Kurt Hewins and Carey Martin in turn four. This is the eighth caution of the night. Laperle went for a long ride through the grass and mud off the turn four banking. Martin found himself pointed the wrong way on the track and threw his car into reverse to race leader Eddie MacDonald back to the line. Martin didn't get there in time and lost a lap. Hewins drove around to the frontstretch, but parked his car there. It needed a tow back to the pit area. 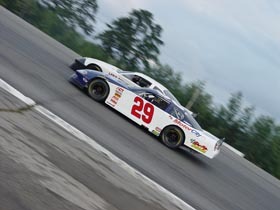 Eddie MacDonald currently leads Joey Pole, Kevin Harvick, Ben Rowe, Larry Gelinas, Brent Dragon, Nick Sweet, Shawn Martin, Scott Payea and Dennis Spencer. Monday, 8:46pm - On lap 98, the caution is out for a solo spin by Quinney Welch. The top 10 are: Eddie MacDonald, Joey Pole, Kevin Harvick, Eric Williams, Ben Rowe, Dennis Spencer, Brad Leighton, Scott Payea, Larry Gelinas and Shawn Martin. 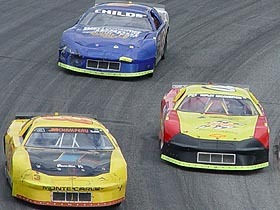 Following them are Nick Sweet, Derek Ramstrom, Jean Paul Cyr, Jeff White, Randy Potter, Brad Leighton and John Donahue. Patrick Laperle, Roger Brown, Joey Becker and TJ Watson are among the drivers who have pitted. Monday, 8:40pm - Cris Michaud has pulled his car behind the wall, joining the Travis Adams, Dave MacDonald and Tommy Ricker - who are all out of the race. 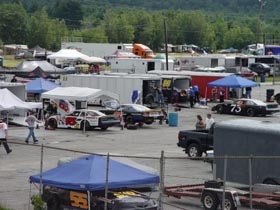 Monday, 8:38pm - We're still clean and green here at lap 87 with the top 10 being shown as Eddie MacDonald, Joey Pole, Kevin Harvick, Eric Williams, Ben Rowe, Scott Payea, Dennis Spencer, Brent Dragon, Shawn Martin and Larry Gelinas. Monday, 8:25pm - Ricky Rolfe, the pre-race favorite of many, has slowed on the track and pitted under green....well, maybe not. The caution came out just as Rolfe hit the entrance of pit road. 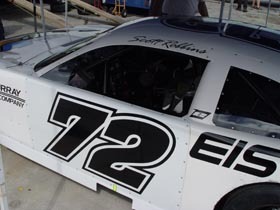 That was due to Scott Robbins spinning and hitting a turn four infield light pole. We're at lap 65 with Eddie MacDonald leading Eric Williams, Joey Pole, Carey Martin, Kevin Harvick, Brad Leighton, Scott Payea, Jeff White, Ben Rowe and Patrick Laperle. MacDonald has led 58 of the first 64 laps, which means big money for the #17 team. Each lap of the 250 pays $100 to the leader. Monday, 8:22pm - On lap 53, Joey Pole muscled underneath Eddie MacDonald in turn one to take the lead. On lap 55, MacDonald retook the top spot. Further back, Martin and Harvick are racing hard still for the fifth position. Monday, 8:20pm - On lap 50, Phil Scott appears to have something break or freeze up on his right front while exiting turn four. he collected Dave MacDonald and wrecked. The caution is out. Kevin Harvick and Carey Martin don't have a lot in common. Martin is an Oxford regular and Harvick is a NASCAR Sprint Cup star. Harvick towed to the track in a semi rig while Martin used an open trailer. But the two managed to find each other on the racetrack before this caution. Harvick ran into Martin on the backstretch and Martin slid through the infield before coming right back out in front of Harvick. When the caution came out, they slammed into each other again . Don't expect Martin to buy any Kevin Harvick gear soon. Eddie MacDonald currently leads Eric Williams, Joey Pole, Brad Leighton, Martin, Patrick Laperle, Harvick, Scott Robbins, Scott Payea and Ben Rowe. Monday, 8:15pm - We are working lap 45 right now and the top 10 are Eddie MacDonald, Eric Williams, Brad Leighton, Joey Pole, Corey Morgan, Kevin Harvick, Scott Robbins, Scott Payea, Patrick Leperle and Ben Rowe. Travis Adams had gone back on the track, but was very slow. His car is now behind the imaginary "wall" of the inside pit road at Oxford. Monday, 8:05pm - Corey Morgan and Dale Verrill got together on the frontstretch to bring out the caution again on lap 33. 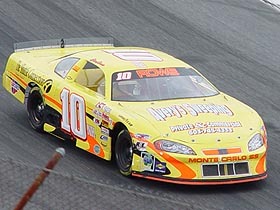 Dave MacDonald had a flat tire on his car as well in an unrelated incident. Monday, 8:03pm - Travis Adams has pitted under green on lap 26. His #03E team has taken the hood off their green and pink Chevrolet and things aren't looking good for them. Eddie MacDonald and Brad Leighton are still leading the race and have pulled away from the field. Monday, 7:59pm - We just had an interesting restart. Brad Leighton appeared to jump it on the outside and the yellow came back out. But he lifted and the green came back out...again...before the start finish line. The field stacked up in several places, but nobody got turned around amazingly. We're working lap 20 right now with MacDonald leading Leighton. Those two have pulled away from Scott Robbins, Eric Williams and Carey Martin. Monday, 7:54pm - The green came out on lap 10, but the caution came back four laps later as Ricky Morse, Jean Paul Cyr, Corey Morgan and quinney Welch got together in turn four. Morse backed down the track and almost collected the leader, Eddie MacDonald. Before the caution, MacDonald had pulled away to a healthy lead over Brad Leighton and Scott Robbins. Cyr and Dave Macdonald are pitting. Monday, 7:50pm - While they sort the scoring out, here is your unofficial and current top 10: Eddie MacDonald, Scott Robbins, Carey Martin, Brad Leighton, Patrick Laperle, Eric Williams, Joey Pole, Kevin Harvick, TJ Watson and Roger Brown. Just outside the top 10 are Jeff White, Ben Rowe, Cris Michaud, Nick Sweet, Dennis Spencer, Scott Payea, Travis Adams and Larry Gelinas. Monday, 7:44pm - We're going green again after some scoring and line-up adjustments. We're working lap nine with Eddie MacDonald leading. ...But in the the time it took the type that, we had another caution come out. Scott Payea was slow getting up to speed and several cars stacked up behind him in turn four. Quiney Welch, Jean Paul Cyr and Jeremie Whorff were collected. Meanwhile, early leader Tommy Ricker stalled his #6 on the entrance to pit road. He was pushed to the infield and his team has raised the hood. 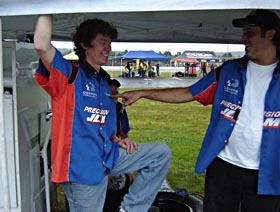 A few members of Patrick Laperle's #91 team appear to be helping out Ricker's team. However, nobody is hurrying so don't expect for him to get back into the race anytime soon. Monday, 7:33pm - "Two lap" Tommy Ricker was true to his nickname as he led the first two laps of the 250. Scott Robbins led from there through lap eight, when Eddie MacDonald took over the top spot. On lap 9, several cars spun in turn four. Ricky Rolfe, Dave MacDonald and Derek Ramstrom all went around, but nobody appears to have hit anything. The first caution of the night is now out. The pits are open, but only MacDonald (Dave, not Eddie that is) and Rolfe have pitted. Monday, 7:29pm - After a three and a half hour rain delay (on top of a one-day rain delay from the orginally schedule Sunday race date), the 35th annual TD Banknorth has now gone green. Tommy Ricker shot along the outside to barely lead lap one over polesitter Scott Robbins. Monday, 7:22pm - The cars of the TD Banknorth 250 are on the track for pace laps. The track looks good, although pit road is still a little wet in places. We expect to have several pace laps before the race goes green. Monday, 7:15pm - The rain delay was a blessing for Jeremie Whorff and his team. Whorff suffered heavy front end damage in his qualifying race earlier in the day and the team was able to use the afternoon to get the car race-ready. Whorff was elgible for a previous race winner's provisional thanks to his 2006 TD Banknorth victory. 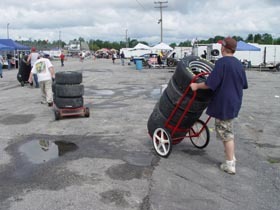 Monday, 7:10pm - Many drivers and crew members called in sick for work today to come and race at the Oxford 250, but one of them when to work anyways. T.J. Watson, who will start 13th, went out on a lobster boat really early this morning to put in a little bit of work before coming to the track to play. Monday, 7:05pm - They've called the spotters to their positions and the track drying appears to be finished. So we're expecting a possible start to the TD Banknorth 250 shortly. There's even a little bit of sun in the sky - something we haven't seen much f this afternoon. Monday, 6:45pm - Since today is a weekday, several teams had to make crew member changes to adjust for guys and girls who had to go to work and couldn't stay over. One of the most interesting ones involved the #91 team of Patrick Laperle, who remembered a conversation from Speedfest at Lakeland, Florida's USA International Speedway (FL). That was when fellow racer Cassius Clark bragged about his tire changing skills. Laperle called Clark this morning to challenge him to put those to use on his car and Clark was flying back from the PASS South race at Orange County Speedway (NC) today, so he stopped by the track on his way back from the airport and put on a Laperle crew shirt to go to work tonight. Clark's father Billy will work as the jackman for the team as well. Loyal readers of Speed51.com may recall that Clark is growing out his hair and refuses to cut it until he wins next. Will a Laperle win allow that to happen? It might. Clark reports that if that happens, they will flip a coin to decide whether to shear him. At least one pit road observer hopes that happens soon. Derek Ramstrom's father Rick teased Cassius that he "looks like Bozo the Clown" with his current hairstyle. Ah....the interesting news items we can get during a rain delay. Monday, 6:30pm - The rain has stopped here at OPS, track drying has been underway for close to an hour. All teams have there pit equipment ready in the infield which is very wet in some spots. At the end of the pit road near the exit there is a large lake of water. 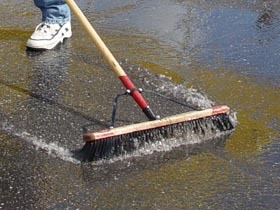 Track officials are working on it. We can see one groove on the high side that is starting to dry. 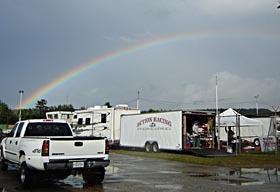 Monday, 5:44pm - Some good new is that the sun came out and it projected a rainbow on the back of the pits near the drag strip. At one point it was a double rainbow, the prize at the end of this rainbow is of course $25,000 and the title as Banknorth 250 champion. Monday, 5:20pm - The rain has slowed a bit and the track drying team is now on the track. 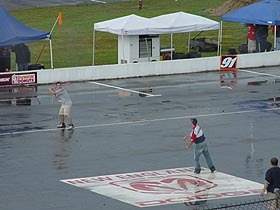 We also saw some of the pit crews playing baseball in the infield. David Ortiz of the Red Sox is playing in Portland, ME tonight with the Sea Dogs double a affiliate. Needless to say he will not be asking any of these guys to try out with the sox. We asked for a score, but the track drying delayed the game. Monday, 4:08pm - The National Weather Service has issued the following special weather statement for this area. The news isn't too good. Meanwhile, the TD Banknorth 250 is under a rain delay just before the feature was set to start. FLOODING...AS WELL AS FLOODING OF LOW-LYING AREAS. ALSO...HAIL UP TO ONE HALF INCH IN DIAMETER...FREQUENT CLOUD - TO - GROUND LIGHTNING AND GUSTY WINDS TO 35 MPH ARE POSSIBLE IN STRONGER THUNDERSTORMS. 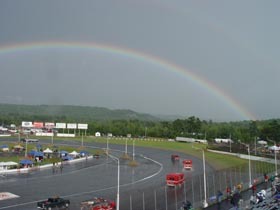 Monday, 3:52pm ET – It is now raining at Oxford Plains Speedway and there is the distant sound of thunder. The weather radar is green and yellow (not good) to the southwest. 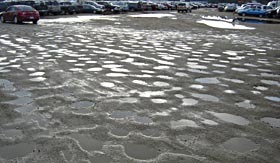 We're about to go under a rain delay despite the best efforts of track officials to keep this race rolling. Track officials are adament though that the race will be run tonight. The thunder has gotten louder and the track announcer has asked for fans to retreat to shelter. This delay is going to take awhile, so we'll be back later on when there is more news to report. Monday, 3:40pm ET – It turns out that even seasoned veterans can get desperate. On lap 10 of the final Last Chance race, Robbie Crouch turned Joey Laquierre sideways while battling for the lead. Jean Paul Cyr scotted by into the lead. On the next lap, Laquierre tried to turn Cyr, but was unsuccesful. On lap 16, Crouch tried to turn Laquierre again and was brake-checked for his trouble in turn three. On the fronstretch, Crouch finally did get Laquierre sideways enough to get the spot - but it wasn't enough. Cyr had checked out on the field and earned a starting spot. The two provsionals will go to Ricky Rolfe (highest point OPS regular) and Jeremie Whorff (former winner's provisional). Teams are bringing their pit carts out to the infield right now and there will be a rolling start to the 250 in about 20 minutes or less. We're in a race against the weather because the skies are dark, but the air is dry at the moment and the race is almost ready to roll. Monday, 3:33pm ET – The second Luce Chance race....oops....Last Chance race is now complete. It was won by Glen Luce. 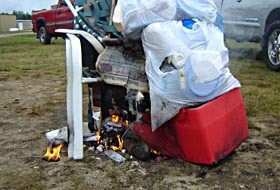 Everyone else in the field will be packing up to go home. Those unfortunate souls include Joey Doiron, Jeff Dery, Tim Brackett, Tyson Jordan and Gary Caron. Ricky Rolfe didn't qualify either, but he'll have a provisional to use. The fun point of the second Last Chance race came on the final lap. Billy Childs, Jr. rode around slow for a full lap before taking a shot at Jonathan Urlin in turn four. Then he blocked Joey Doiron in a move of incident contact. everyone got back up to speed and Childs came back to literally run over the top of Urlin's rear end in turn one and sent himself flying off the tunr one bank. That all happened on the last lap and appears to have been some type of payback move. Monday, 3:20pm ET – We might have seen the Cinderella story of the 250 weekend in the first Last Chance race. 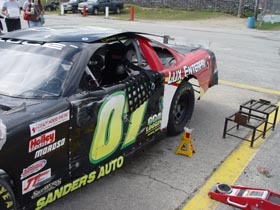 Scott Luce looked to have destroyed his car in yesterday's heat race (look to the right side of the page to see a photo of the wrecked #07), but somehow he got it back on track today. Even more amazing was the fact that he won the first Last Chance event to get into the field. Only Luce advanced and those not making the show include Pete Potvin, Travis Sterns, Donald Theetge, Ricky Wolfe, Matt Sanborn, Jimmy Childs and Shawn Knight. A little bit of bad news from the track as well - the clouds to the West are getting really dark and the radar doesn't look good. We might be in for more rain shortly. Monday, 3:05pm ET – The final consi for the TD Banknorth 250 was won by Brent Dragon. also taking transfer spots were John Donahue, Darren Ripley and Quinney Welch. Next up will be three last chance races where only the winner will advance to the big show. Among those not qualified so far are Jean Paul Cyr, Robbie Brackett, Scott Luce, Glen Luce, Tim Brackett, Ricky Rolfe (who has a provisional available if he needs it), Pete Shepperd, Donald Theetge, Bobby Dragon, Pete Potvin, Travis Sterns, Bruce Thomas, Matt Sanborn, Jonathan Urlin, Joey Laquierre, and Ricky Wolfe. Monday, 2:57pm ET – Several drivers did not return today for the make-up running of the TD Banknorth 250. That list includes Alan Tardiff, Ryan Nolin, Eric Chase, Jamie Fisher, Claude Leclerc, Josh King, Pete Vanderwyst, Marc Curtis and Thomas Metcalf. Monday, 2:50pm ET – Those transferring out of the second consi were Kurt Hewins, Corey Morgan, Randy Potter and Ricky Morse. Monday, 2:38pm ET – The end of the first consi was a wild one. Shawn Martin won with Phil Scott and Joey Becker right behind him. The race for the final transfer spot got really crazy though. Pete Potvin, Jimmy Childs, Gerald Parlin and Matt Sanborn got collected and Dave MacDonald scooted on by to take the final transfer spot. Monday, 2:32pm ET – With two laps to go in the first consi race, Jimmy Childs and Ricky Wolfe tangled in turn one and brought out the caution. They were both one spot away from a transfer position. Dave MacDonald spun a few laps earlier and is now deep in the pack after contending for a transfer spot early in the race. Currently, Shawn Martin leads Phil Scott, Joey Becker and Pete Potvin. 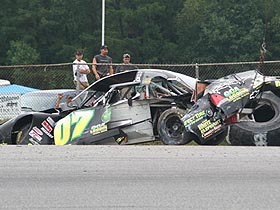 Monday, 2:20pm ET – On lap seven of the first consi, there has been a big wreck on the backstretch. The #80 of Donald Theetge rode up and over the top of the #85 of Travis Sterns coming out of turn two. 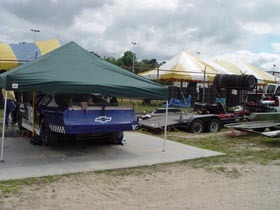 The cars of Tim Pendergast, Gerald Parlin and Matt Sanborn were also involved. Monday, 2:12pm ET – The sixth and final heat race is in the books and it was Eric Williams, Jeff White, Larry Gelinas and Karl Allard who advanced to the big show. The others will run the consi. Monday, 2:05pm ET – Race number six is underway and after 9 laps, Karl Allard, and Jeremie Whorff got tangles up when Ben Ashline got turned around in turn three. Whorff got nose damage while Allard almost went swimming in turn four. Monday, 1:30pm ET – We will be racing at the top of the hour with the sixth and final heat race. After that we go right into the consolation races. The track has more rubber on it now then it did at all when they went green for heats yesterday. The mix of weather and track time is going to make this one of the more interesting 250's yet. Rain has been a part of this race's story before - most notably in 1991, 1986 and 1979. In 1991, they ran the event the same day, but with a rain delay. In 1986, the races were pushed back a day. Back in 1979, it was a whole week that went by before the race was run. Each of those years the race was won by a first timer. Ricky Craven in 1991, Chuck Bown in 86 and Tom Rosati in 1979. Monday, 12:20pm ET – Practice is winding down as we are in the final 10 minutes. The support races will be taking place after the 250 today. Track officials want to get everyone how as soon as they can. Several guys from Canada will take a long trip home after the feature. Monday, 11:49am ET – We know that no one slept better then Scott Robbins. He will lead the field to the green for the 35th annual Banknorth 250. He of course is a former champion of the race. He hope he has a sleepless party filled night like he did back in 2002 when he won $ 37,000. Monday, 11:30am ET – Good Monday morning from Oxford, the rain has left the area and the track is dry. Cars are on the track now for the one hour Late Model Practice. We will start our day at 2pm with the 6th heat race which is listed below. Want to follow along at home as the starting grid for the 35th Annual TD Banknorth Oxford 250 is established? Here is a list of cars that drew for qualifying spots yesterday. We do know that Alan Tardiff and Marc Curtis loaded up after yesterday's rainout. 1 1 Bill Childs Jr.
10 10 Bill Whorff Jr.
53 95 Dennis Spencer Jr.
61 38H Ricky Wolf Jr.
66 8NH Rick Thompson Jr. Tires were all impounded before teams left last night. Drying things out has been the story of the weekend. Carey Martin has made the race for the second year in a row. He still uses his open hauler to get to OPS.